If your church or religious organization sponsors special events that require fast and efficient notification to its members, then consider using automated calling services from Database Systems Corp. (DSC). Broadcasting church phone calls to all or selected members of a congregation can now be automatically performed using technology DSC. DSC provides calling services that can send church calls such as welcome messages to new members of a congregation. This same service can be used to broadcast phone messages announcing church events and membership drives. Even emergency alerts and notices can also be delivered to a congregation in a quick and efficient manner. DSC's voice broadcasting technology can help churches maintain contact with existing members of a church or synagogue or can be used to contact new and prospective members. This is now a much easier task when using our church phone notification services. 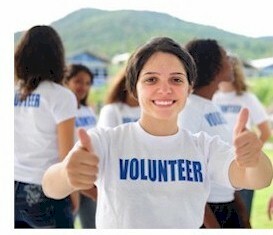 DSC provides automated calling services to both business and non-profit organizations. Start Calling In Just Minutes!. Using our new online signup lets you get started immediately with your calling campaign. Simply create an account and agree to our standard terms and conditions. Then download your list of phone numbers and record a message. We accept major credit cards and for as little as $25, you can begin calling. Its that simple! Signing up is free and requires no payment until you begin using our service. Once you have filled out this online service form and submitted our online agreement, a representative will contact you regarding our convenient payment methods and your account will be activated immediately. Because of the potential for misuse of this powerful communications media, DSC requires proper identification. Contact DSC to learn more about our church invitation calling services. 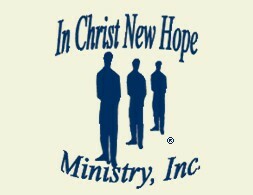 In Christ New Hope Ministry, Inc.
A ministry blessed (empowered to prosper) to equip believers with the inspired Word of God to fulfill (the whole man) spirit, soul and body; to have a solid foundation in the Living Word of God with signs following, with the assurance that God is not a respector of person. Helping those in the body to find and fulfill their place in ministry." In Christ New Hope Ministry has contracted with Database Systems Corp. to provide church phone message broadcasting services to its members. Messages are delivered to answering machines and individuals for event notification - especially church invitational and funeral announcements where there is a very short window of time to notify its membership. Voice broadcast messages are also sent to church members for other special meetings and events. 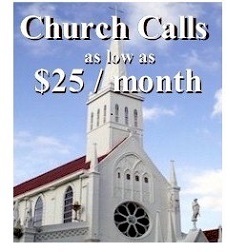 Automatic church phone announcements and church invitations are becoming very popular and affordable these days. Automatic church call messaging lets you contact your congregration quickly with one precise message. In the past, phone trees were set up by a minister to get call messages out to a congregation. But this required constant recruitment of church members and it was easy to break the phone tree process. When expediency and cost are a factor, automated church messaging can help get your announcements out in a reliable fashion. Even members who are at church regularly may not get the message about upcoming special events. The following are just a few of the applications for this economical church announcement service. Contact DSC to learn more about our church event notification and calling services. Church-Calls.com is Trademarked by Database Systems Corp.